A majority of retainers are removable and you need to take them out when brushing, eating or flossing. This makes them easy to misplace. A good habit to get into is to always carry your retainer case and use it whenever you are not wearing your retainer. For extra protection, never leave the case on a table or a bench and always put it immediately in your backpack, purse or pocket. Your dentist can give you any information you need on how to clean or care for your specific type of retainer. You need to make sure you don’t sit on, step on or otherwise damage this piece of equipment regardless of any type of model it is. How long do I need to wear retainers after my braces come off? Your dentist can tell you how long you should keep wearing your retainer. The purpose of retainers is to prevent your teeth from moving back to their original position. They should be worn at least until your jawbone and tissues have had time to stabilize around your new aligned tooth. Orthodontists recommend that children and teens wear retainers until early or mid 20’s or until all the permanent teeth have come in and the jaw stops growing. 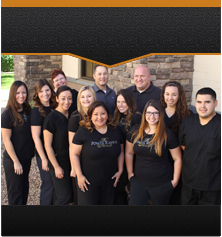 For further questions regarding retainers, please give our office a call at (480) 988-2282. Thanks!